So there has been this idea in my head for a long time now – every now and then I see a car with a certain colour and I imagine the matching nail polish to it. The following post shows some matches I made in my head lately, and I think some of the car paints come pretty close to certain nail polishes. 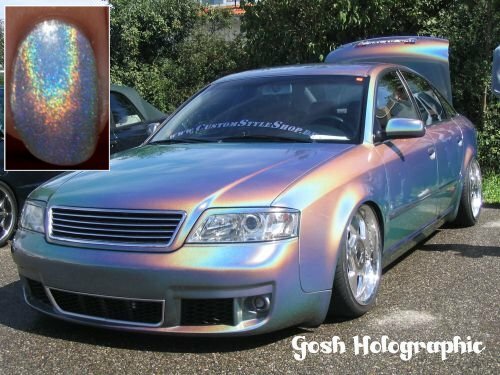 I love the way this car looks in the sun – holographic goddess just like our best-known OPI “My Private Jet” in the holo-version. I want carpaint like that on my car!!! 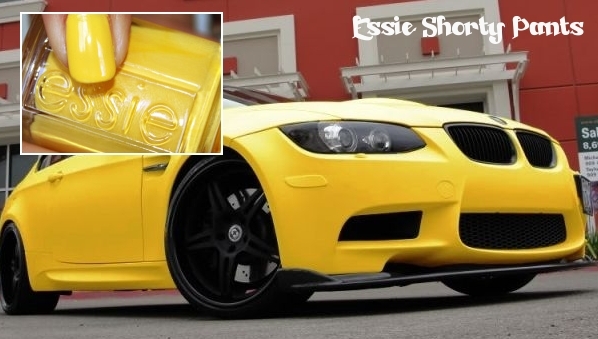 How cool would it be to own this sporty car and paint your nails in the same colour? Unfortunately, neither the polish nor the car are easy to get – the car because of the price, the polish because it was from an Essie collection called “Neon collection” and it was launched in the Spring and Summer of 2008. 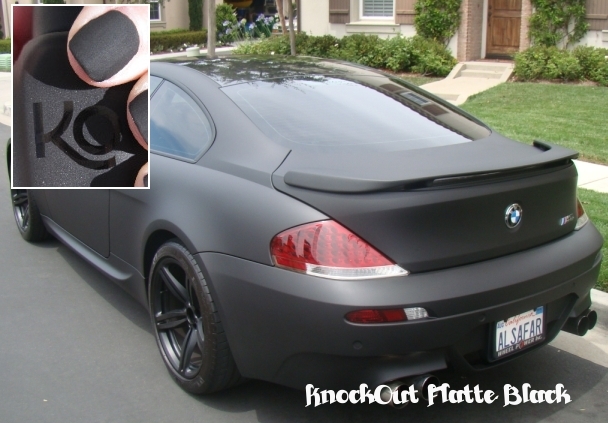 Can you believe that even the matte polish look is transferred onto cars? I have seen some matte cars lately and I must say, it is not really my style. Like this plain black matte car. Still looks strange to me. I hope this car was sprayed and not covered in Minx-foil. 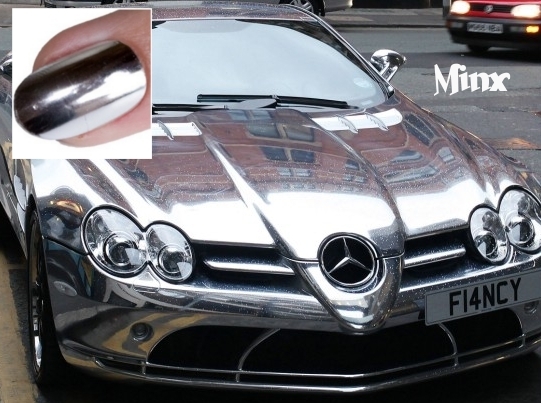 All the nail polish girls know: a real shiny finish like on the car has to be done with Minx, there are a few foil-like polishes out there but none of them has the exact shiny finish like the Minx. Now, what a match! 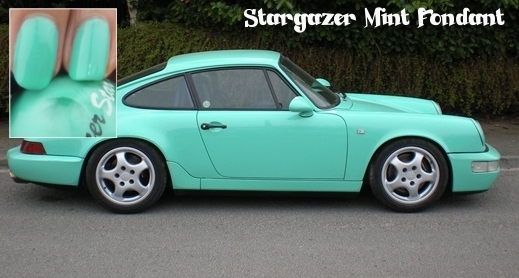 With this mint-green Porsche i’m sure everyone will see you. Same with the nail polish, there are lots of mint-green shades of course, but the one matching best to this car paint is from Stargazer. 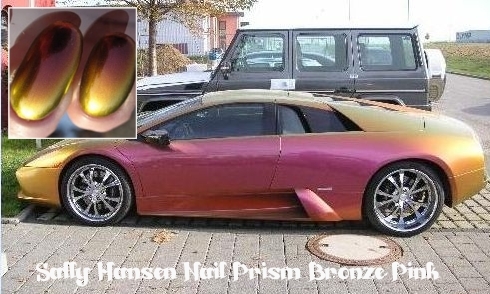 Now check out this duochrome-car! I found out that in the car-language, these duochrome paints are called “Flipflop” and there are some really pretty ones. This one in particular reminded me of Sally Hansen Nail Prisms in Bronze-Pink. So pretty! Last but not least another holo-paint. God, now I really want to get my car done like this! On the other hand – while on my nails I can choose a new colour whenever I want, once on your car you are stuck with a certain colour. Geez I could go on like this forever! Maybe there will be another post like this in the future. Please be reminded that the pics of the nail polishes integrated in the car-pics are randomly picked from nail polish blogs all over the internet. I couldn’t find any copyrights on them but if you feel offended, please contact me immediatly! Thank you! The same holds for the car-pics. I didn’t mean to steal any picture-material. Thanks for looking! BTW, crackling-paint is now also available for cars! edit: Did you like this posting? Then maybe you will also like Part II with more cars, more nail polishes, more finishes! I love all of the color including the Matte Finish. i love this post!! i want a holo car! Thank you! Me too actually – how cool would that be?? thanks for this tip! 🙂 However, you should always keep in mind that car paint wasn’t made to put on your nails. There might be chemicals in there that are not supposed to get in contact with your skin. Just sayin! What a neat post. I haven’t seen a color changing/duochrome car in several years…I mean like over a decade. And even when I did see them I probably didn’t see more than a handful of them. I thought they were the coolest things. I’m sure the cost of the paint job was thru the roof…it would make sense since there weren’t more of them on the streets. 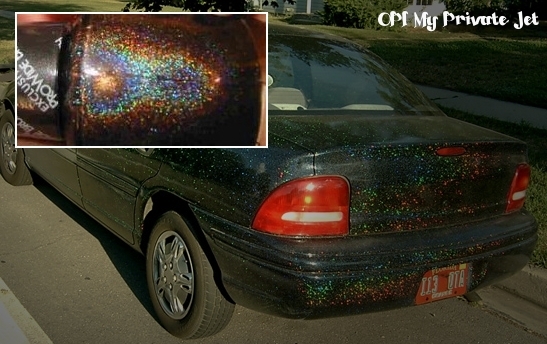 I never saw a holographic paint job…very cool looking!! What a great post! It’s original and you paired the colors so well! Thank you! It was so much fun to write this post too! Thank you! I’m so into holo, too – rainbows on my nails, yes please!! Wow! that was a pretty interesting blog post. Enjoyed that fact that you incorporated cars with polish colors. Did you know OPI has a line of polish for Mustang? 🙂 Pretty darn cool especially if you like sporty cars. What a great post! I loved reading it. This is really a great idea, I sometimes think about nail polish finishes and how they would look on a car..I must admit that lately I see more and more cars in matte colour.